dand7424 has no other items for sale. 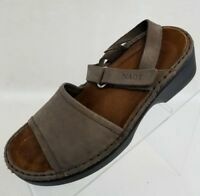 NIB NAOT Women's Latte Brown Gold Leather Intrigue size 8 M US EU 39 Brand new! 🥿 Naot Mary Janes sz 8.5 M (EU 39) Black Leather, Suede & Patent; Nice!